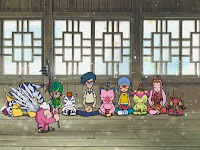 In this episode, an ancient master offers to train the digidestined. Every training scene cliché is pulled out except the 80's movie montage. That's why they didn't learn anything. It's amazing just how incompetent the gang has gotten since arriving on Server. 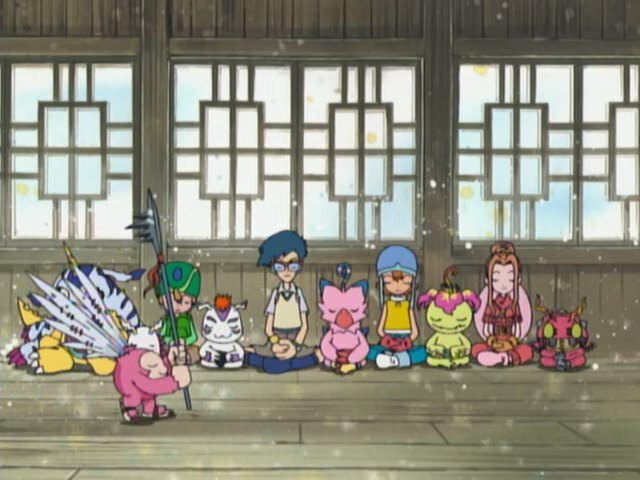 After banding together to beat Devimon, the digidestined have fallen into three obvious traps, let a Koromon village get completely toasted, forced a dark digivolution that shattered Agumon's confidence, watched their Digimon turn to stone and generally let Etemon have his way with them. They still can't even beat that damn Kuwagamon! Seriously guys, it's one thing for Tai and Agumon to get gun shy, but when a giant stag beetle is about to kill them, can't somebody step up and save their lives instead of gawking at the sudden mortal peril? They don't deserve to be rescued, but if the plot says they must, at least it's a little pink critter that exists solely to make you look bad. Hang your heads in shame! Anyway, Piximon is here, yup yup. Clearly, some magical girl anime is missing its animal mascot. He's of the same ilk as Luna, Kero-chan and that ferret thing from Nanoha that nobody cares about. He talks like Ducky from The Land Before Time. So obviously he's incredibly powerful and wants to train the team. Or just screw with them. You can never tell with mahou shoujo animal mascots. Once they go through the portal to his training facility on top of a tall mountain, we discover that his training regimen is typical... if you watch enough movies. He's equal parts Mr. Miyagi, Pai Wei and Yoda. He forces them to clean the giant temple, deprives them of food, gives them nowhere to sleep and locks Tai and Agumon in a cave of darkness. Inside, they slice Etemon's head off and discover that Tai's the man in the monkey suit. Or not. What they really do isn't bad either. A little trite, perhaps, but they sail down a river in a rickety boat and its all metaphorical and crap. At the end of the ride is a lesson from Tai's past. Now Tai has to convince Then Tai (and, by nature, himself) keep climbing on a bike after several failed attempts to ride it. It's not original, but it's simple, gets the point across and Then Tai is adorable. 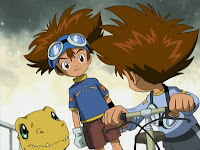 Back on the flipside, Matt and Izzy make the incredibly stupid decision of heading down the mountain without their Digimon in search of their crests. Judging by the distance Joe's tag picked up a signal, they should have known that they could have been in for a hike and dismissing the notion of taking protection was just moronic. Still, Matt and Izzy are typically on opposite sides of Tai and don't talk to each other much, so getting some chatter between those two was appreciated. Matt's introspective comment about using his crest to improve himself was a nice reminder that he's still in the series. The plots collide exactly as you'd expect: after getting their crests, Matt and Izzy end up in trouble and Greymon makes his triumphant return to save them. It's not particularly original, nothing in this episode is, but there's flourishes here and there that make it cute. Just not great. I don't know if it was intentional, but the weird discrepancy between the fading desert background and the digidestined huddled up just looks wrong. Look out Joe! Sora and Mimi got that look on their faces when discussing Tai, Matt and Izzy's absence. They've already got you penned as a target. Run away while you still can! “Far from over your training is,” says Piximon at the end of the episode. He's gone full Yoda, yup yup. Hey! "That ferret" is only not cared about because he turns out to be a human male potential love interest and Nanoha fans despise the idea of het. The soundtrack, ahhhhh. If I remember correctly, this episode is the first time Bolero is played, so much class. Great post and site, good work. does Izzy have blue teeth in that last pic...? 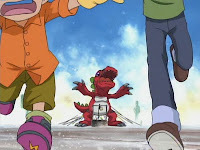 In Tamers, Episode 10 is called 'The Icemon Cometh'. Dots.
" He talks like Ducky from The Land Before Time." I just noticed that!! Thanks! Just an okay episode overall. It's certainly entertaining enough to keep one engaged, and the stuff with Tai was the best part. Also, thank goodness that Piximons' place doesn't look all deserty! Talk about a welcome change of scenery! But not even that can disguise the episodes' faults, namely about how again the crest finding thing was a random incident that took a backseat to bigger occurrences, the Mr. Miyagi training sessions that Piximon assigned were forced and predictable, our heroes getting so incompetent to the point of irrationality, and Etemon, for all his threat level, starting to lose his efficiency and come off as a Saturday Morning cartoon variety villain. Oh, but worst of all? Piximon is just ANNOYING. I watched the Anime in german and in that version I actuly liked Piximon more than most of the main Character groupe Digimon. Adventure Episode 22: Forget About It!